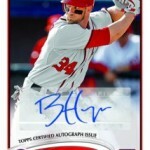 2012 Topps Series 1 Baseball comes out next week and there are plenty of promotions to go with one of the biggest baseball card releases of the year. Topps has just announced that collectors who send in 50 hobby pack wrappers or 14 jumbo pack wrappers will receive a 5-card cello pack of exclusive Gold Rush cards. 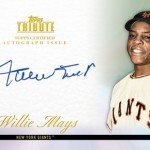 There are 50 cards to collect in all, as well as the chance at autographs of players like Willie Mays, Adrian Gonzalez, Sandy Koufax, Nelson Cruz, Albert Pujols, Albert Belle, and Dennis Eckersley. 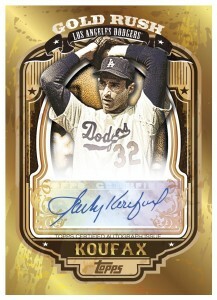 Topps was also able to insert limited quantities of two of baseball’s biggest free agents into the product. 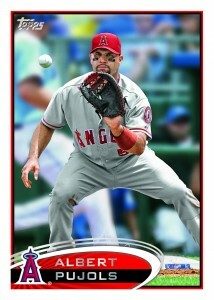 Look for both Albert Pujols Angels cards and Jose Reyes Marlins cards! Boxes of 2012 Topps Series 1 Baseball deliver 1 Autograph or Relic Card Per Hobby Box and 1 Autograph & 2 Relic Cards Per Jumbo Box. 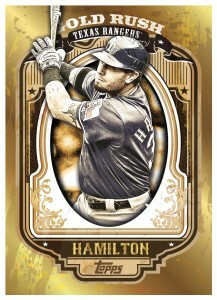 There are tons of other new inserts and promotions centered around the “Gold” concept. To check out all of the product information on all the great stuff you can pull as well as some product preview images visit our 2012 Topps Series 1 Baseball Hobby Box Page. 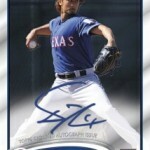 To stay up to date on the Topps Company and the February 1st release of 2012 Topps Series 1 Baseball check out the official Topps Facebook Page and follow @ToppsCards on twitter. 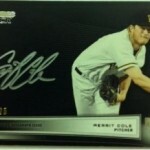 COUNTING DOWN TO 2012 BOWMAN BASEBALL…The Debut of Bowman Black! 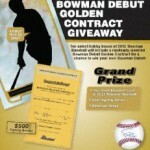 COUNTING DOWN TO 2012 BOWMAN BASEBALL AND YOUR CHANCE TO BE ON A BOWMAN CARD!